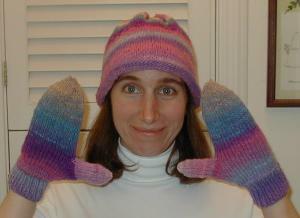 With some leftover Kureyon from my new year's sweater, I made this hat and mittens set as a Christmas gift for my mom. I used patterns from Ann Budd's Knitter's Handy Book of Patterns (quickly becoming my favorite knitting book!). Using the Kureyon again was a great way to wrap up a wonderful year of knitting.